Do you know what kind of leader you are? Or, better yet, do you know what kind of leader you want to be? In this video, leadership coach Susanne Madsen explores the Project Leadership Matrix, a tool that helps you take control of your own leadership approach. There are a lot of articles on how to be a better project leader. But first you need to know what kind of leader you already are. Susanne introduced the Project Leadership Matrix, which is a fantastic tool you can use anytime to help keep you focused on your ideal leadership approach. The right side is where those with a people-management focus land. These are leaders who inspire and engage their their teams and provide them with a great deal of autonomy. On the left side, there’s leadership through task management, a more authoritative, directive method. The top of the matrix represents the proactive leader who focuses on the project’s strategic mission. The bottom half of the matrix represents people who are more reactive and deal with the immediate issues as they arise in a project. While we’re all different and there’s likely none of us who fall squarely in one corner, the most effective project leaders fall within a mix of quadrants three and four. Being pro-active while both authoritative and engaging, is clearly better than playing catch up and reacting to the crisis of the day. Where do you think you land on this matrix? And what strategies can you put in place to help guide you into being a more proactive project leader? Take it further: Watch Susanne’s companion video and learn What is Your Leadership Style. Hi, I’m Suzanne Madsen. Welcome to this whiteboard session on the Project Leadership Matrix. 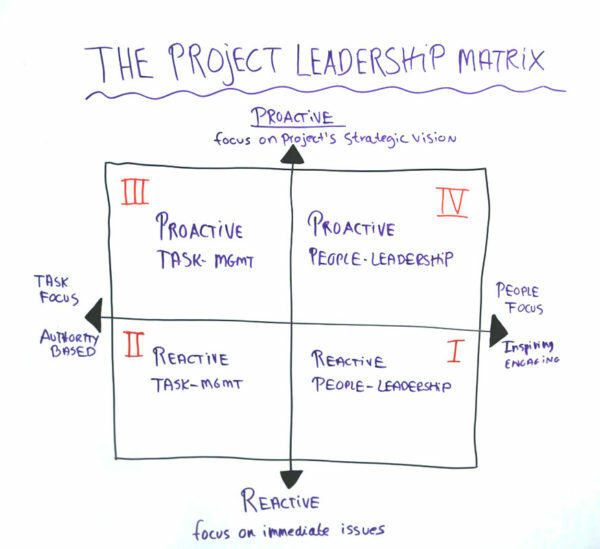 The project leadership matrix is an ideal tool for helping you understand where your focus is and if it’s in the right place. As I walk through it, consider in which of the four quadrants you spend most of your time. On the right-hand side, we have someone with a people focus. This is where we lead free people. We inspire people to follow. On the other side, we have someone with a task focus. We lead through tasks, we’re more rational and logical, and maybe authority-based. At the bottom, we have people who are reactive, we focus on immediate issues. And at the top, someone who is proactive, focused on the project’s strategic mission. On the four different quadrants, we have number one, reactive people leadership. If this is where you spend most of your time, it means that you’re drawn to helping out when there’s interpersonal conflict. You’re a natural mediator. Quadrant number two, reactive task management. This is where we have a lot of defect management, issue resolution, and firefighting. Moving up to quadrant number three, proactive task management. This is where traditional project management disciplines sit. It’s all about planning, managing risks, and quality assurance. We’re looking ahead to mitigate items, but it’s still with a task focus. Nothing wrong with that though, but what about quadrant number four? This is proactive people leadership. Here, we’re focused on strategic relationship building, on the project’s vision, and providing direction to the team. Have you figured out where you spend most of your time? A lot of project managers I coach spend a lot of time in quadrant number two. That’s unfortunate, and it can be a vicious circle, because when we’re down here, we’re not able to free ourselves up to be proactive, that’s where the results come from. We have to plan for tomorrow. Ideally, we should be placed between quadrant number three and four. People sometimes believe that quadrant number four is the best one. But if we’re solely here, what about the planning? Who’s going to do that? We can’t just leave out the operational plans. We have to have a really good mix between the two. And we have to right at the top of the matrix, because that is where we get results. We have to be proactive. There may be times where an issue comes along, and we will have to jump down and sort it out, of course. But it shouldn’t be our modus operandum. Is Donald Trump Ruining Your Project?